I couldn't resist checking out the new DTGD challenges over on SCS. 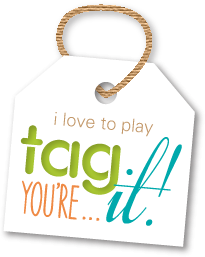 Have you been playing along? I couldn't play over the w/e, but have squeezed in a couple of cards yesterday and today. I used 4 out of the 5 of today's posted challenges on my card. For details, you'll need to check out the gallery for fan club members HERE! 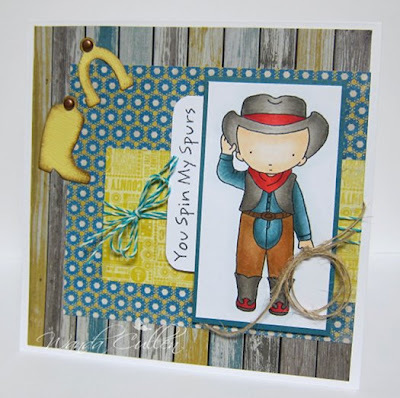 I used the color combo, the sketch, bling and did double embossing. ACCESSORIES: Square Lattice EF, Melon Mambo EP, Rhinestones, Orange Zest satin ribbon by PTI, Stitching, Brad, Tiny tag die by PTI, Foam dots to layer the flower. 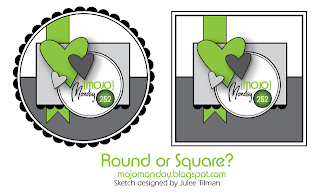 This is a 3 in 1 card - made for the Mojo Monday Sketch Challenge and also for 2 of the Dare to Get Dirty Challenges over on SCS (Bev Gerard's and Teresa Kline's challenges). There are lots of fabulous prizes to be given away, so head on over HERE to read about the details and dare yourself to get dirty! 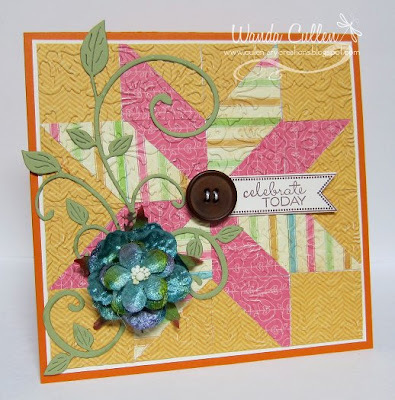 I love this fun loopy flower stamp from Verve's Making a Statement set with its matching die. I layered tiny black punched circles and rhinestones in the flower centers. The polka dotted paper is flocked and gives the card a surprise element of texture that I love! The sentiment is from Verve's Hope Blooms set. Paper is "Chapter One" pad by Kaisercraft. Thanks for stopping by...I'm heading out to work soon where I'll be faced with a huge admission day - close to 60 new clients are due to arrive on our rehab campus! May need to choose roller skates for shoes today! Have you gotten to join the Dirty Dozen yet in the challenges, chatter and stamping that kicked off on July 28th? 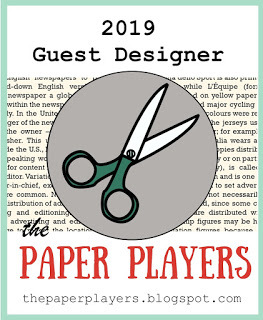 Dirty Dozen design team members have been busy cooking up dozens of creative challenges sure to revive even the rustiest mojo, and the generous Member Companies have sponsored the event with some fabulous prize packages for players. 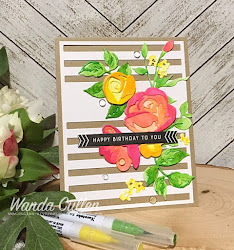 My schedule was just too jam- packed this summer to host a challenge, but I did manage to make this sample card for my good friend, Teresa Kline aka va.sunshine, who is hosting one of today's challenges. I can't go into detail about her challenge because you need to be a fan club member on SCS and then you can get all the details! This week-long celebration is a thank you event for the Fan Club members who support the SCS site with their subscriptions, so join us here today and then come play along! There's a whole lot of Vervey goodness going on with this card...both stamps and dies! ACCESSORIES: Crimper, Seam binding, Offray elegant flower w/pearls, Leafy sprigs die, Charming Banner die, Jotted Heart die & Robbo Banner dies - all by Verve. That sentiment totally makes me smile! 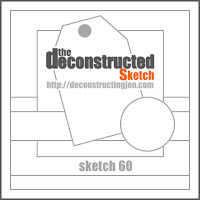 Another great sketch is posted in the MFT forum on SCS for the Wednesday Sketch Challenge. 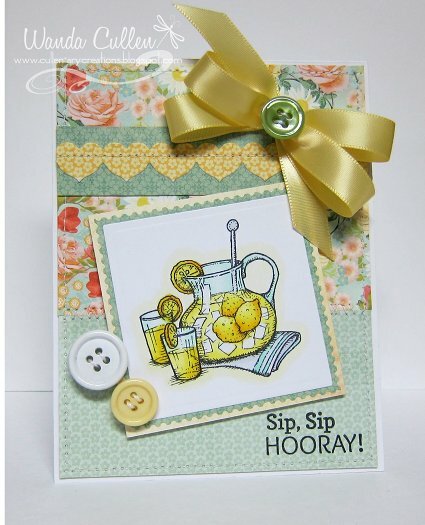 I made this card late last night after getting off work...a great way to wind down! I wish I had stitched the layers, but didn't want to wake DH with my noisy sewing machine - lol! Hello friends! It's Wednesday and time for another Color Throwdown Challenge! 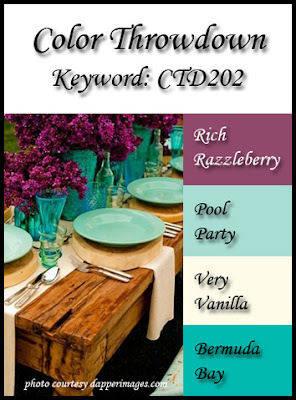 This week, Tammy has a beautiful table setting photo for our inspiration...aren't these colors fabulous?! 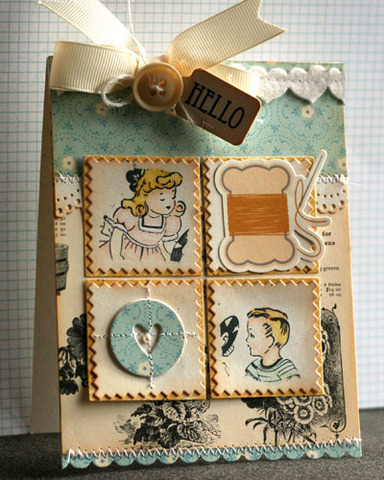 I made a solo excursion to a local stamp store, Paper, Ink!, in downtown Charlottesville last week and this Memory Box "Chloe Stem" die was one of several goodies I found. It reminds me of the fields of Queen Anne's Lace that are blooming everywhere this time of year. I stamped the Carte Postale script stamp in Bermuda Bay on a vanilla Top Note die shape, then sponged the edges with Pool Party ink. ACCESSORIES: Bermuda Bay grosgrain ribbon by SU, Tiny Tags die (PTI), Button by SU, Chevron Die-Namics by MFT, Chloe Stem die by Memory Box, Top Note die by SU. Don't forget to check out all the inspiration by the rest of the design team, as well as our talented July guestie, Judy Rozema, HERE! As always, if you don’t have the exact colors, it’s no problem...just substitute with what you have that’s close to this week’s colors. And, don’t forget to use the keyword CTD202 if you upload your project to an online gallery. Good Monday everyone! 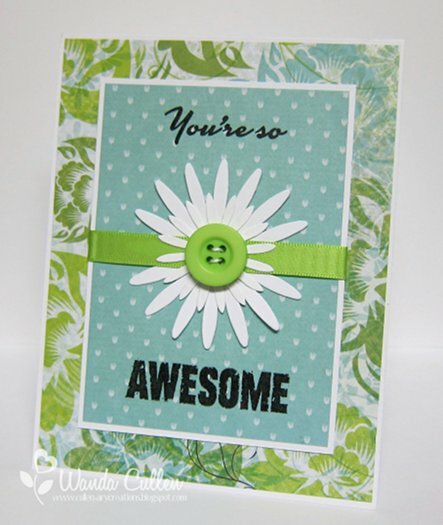 I have a lot on my "to do" list for this week, so kept this card really clean and simple. 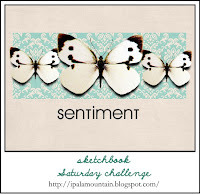 I'm a fan of Chupa's Saturday Sketch Challenge layouts and this one was so fun and easy to use! If I need a 15 minute card in the future...this will be the way to go! ACCESSORIES: Daisies die by SU, Satin ribbon, Button, Cotton thread. The Verve divas are having a July Diva Dare challenge and the theme is birthdays! 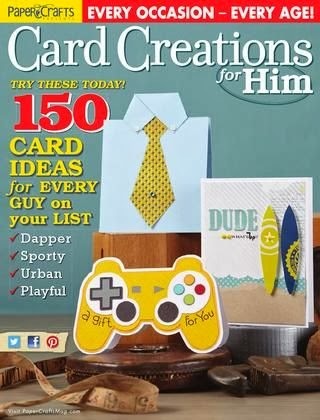 Recently on SCS, there was a tri-fold pocket card challenge which I never had time to try and thought this would be the perfect solution for a birthday gift/card in one. I die cut a long tag using SU's Bigz Two Tags die and adhered a gift card to it, so it would serve as a pull tab. 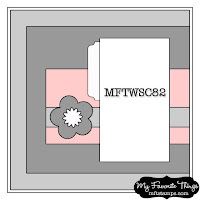 The link to Beate's tutorial for this tri-fold pocket card is in the SCS resources section HERE. 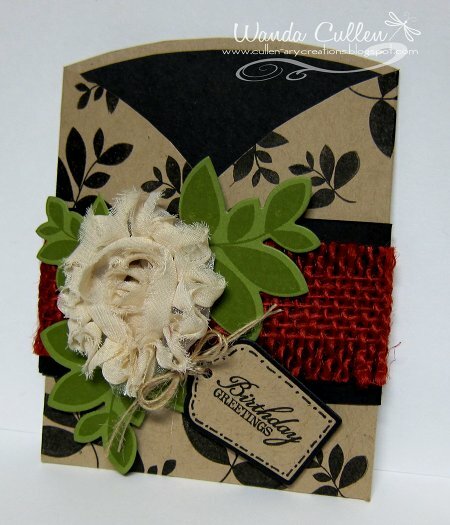 ACCESSORIES: Tiny Sweet Scallop tag die (Verve), Elegant Leaves die (Verve), fabric flower and burlap border from Funkie Junkie store, Jute twine. Start Each Day With "Whee"! Whee! 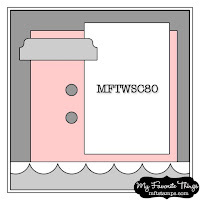 It's hump day and that means the MFT gals have a new Wednesday Sketch Challenge in the forum on SCS! I had bought this stamp from a girl who has given up stamping for other priorities in her life and I had never inked it up. I chose to ink up only one word from the sentiment (using a black distress marker) and colored the image with Copics! What did I use? E55, E57, E59 - swing. Our 200th challenge celebration was a lot of fun this past week and we saw some amazing entries from you fans! Just a reminder to check out the winners' list on yesterday's CTD post HERE. But now it's time to move on to the next 200 challenges! 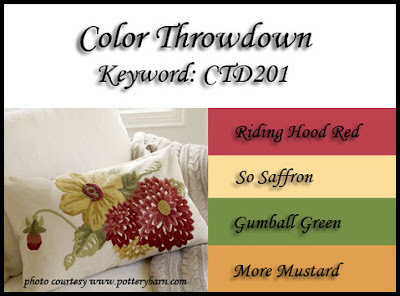 I am hosting this week and found this throw pillow photo from Pottery Barn with some versatile colors... I hope you like it! If my mother were still living, today would be her birthday! I really miss her, but know she's celebrating in heaven, so that's why I went with a birthday card in her memory. 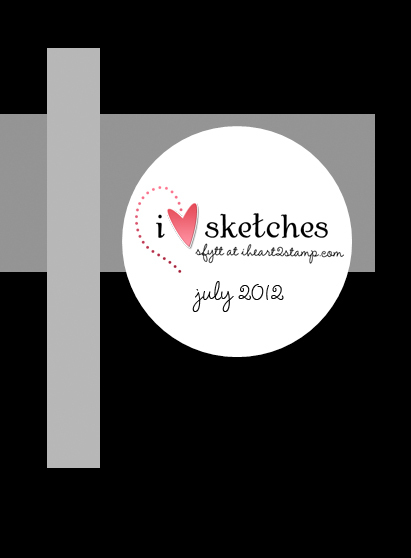 The layout is using Jen Del Muro's Sketch For You To Try for July and what a fun one! 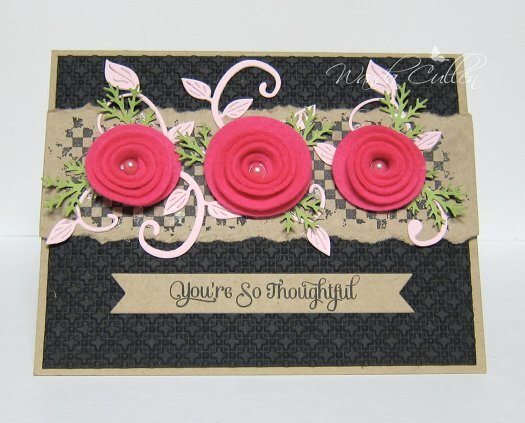 For the vertical element, I opted to use the leafy vine and mini roses Die-Namics by MFT since they are the sponsors for the SFYYT challenge. The sentiment is from the "You're So Tweet" Pure Innocence set. 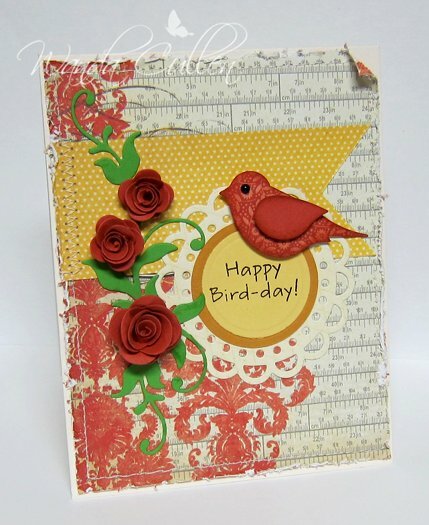 I used SU's 2-step bird punch and sponged the edges with Tim Holtz' Fired Brick distress ink. A little distressing and stitching details were added as well. DP is from MME's Lost and Found Two "Rosy" pad. 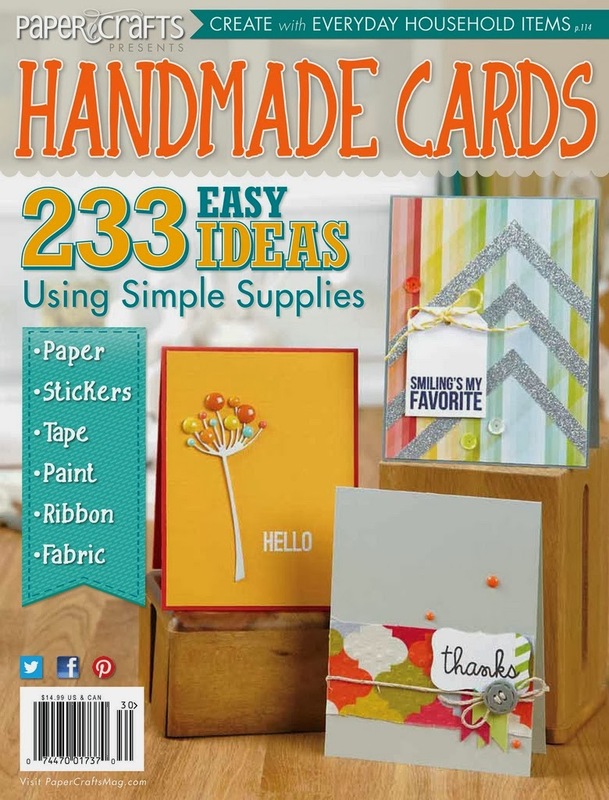 I'm getting so anxious to see the new papers released at summer CHA...not that I NEED any more paper - lol! Don't forget to check out all the inspiration by the rest of the design team, as well as our talented July guestie, Judy Rozema, HERE! 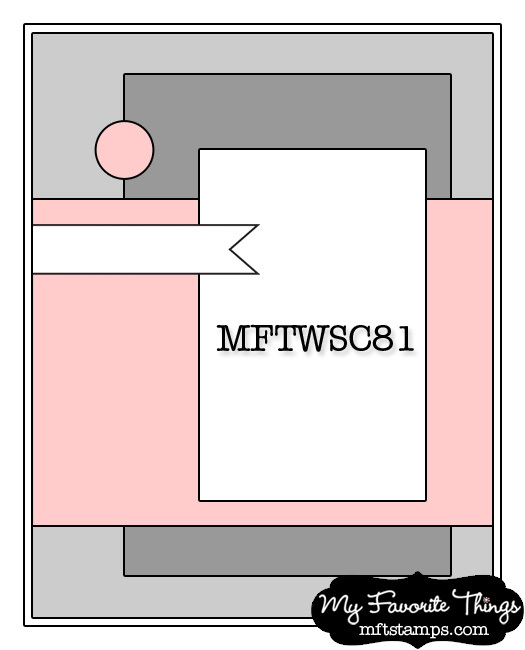 As always, if you don’t have the exact colors, it’s no problem...just substitute with what you have that’s close to this week’s colors. And, don’t forget to use the keyword CTD201 if you upload your project to an online gallery. Hope to see you in the gallery! Cheryl Lea - you're the winner! 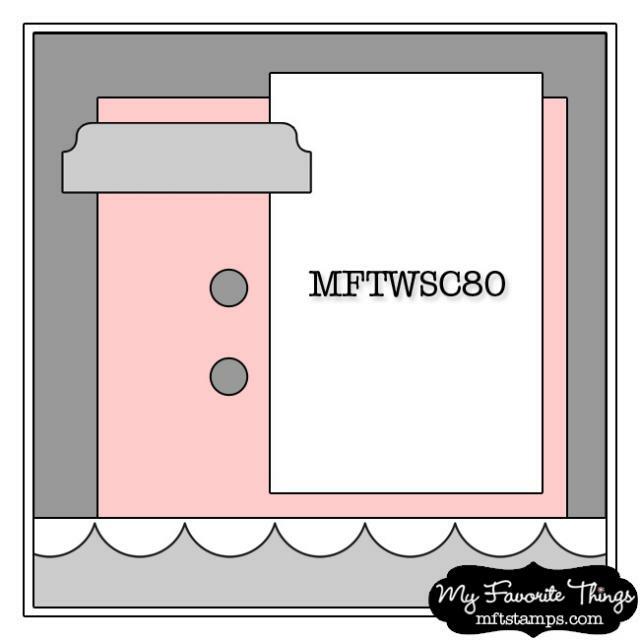 Please contact me at cullenwrATyahooDOTcom with your mailing address and I'll get your goodies sent out to you! Thanks to everyone who commented and played along with us! 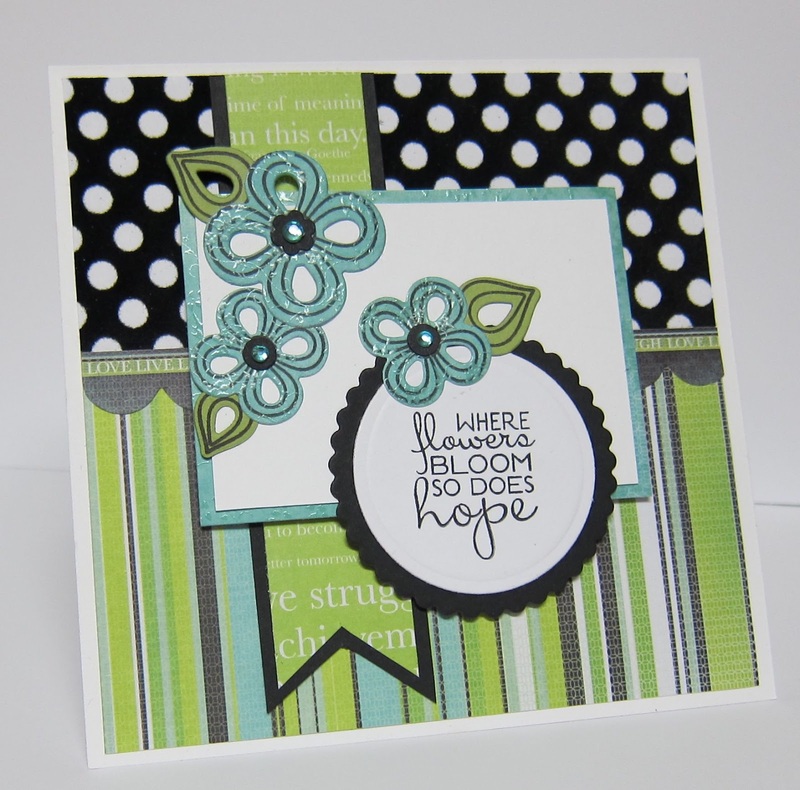 Tune back again tomorrow when I'll be hosting a new CTD challenge! 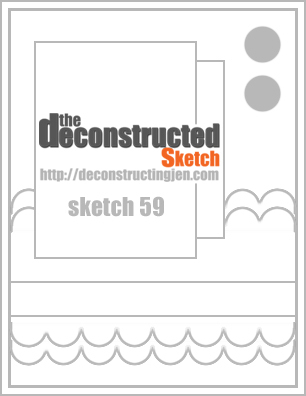 Before I leave this post, I want to add a card that I made using Jen Shultz' layout for her Deconstructed Sketch Challenge #60. I had these papers - 7 Gypsies "Venice" pad - out from a previous project, so went with it again. 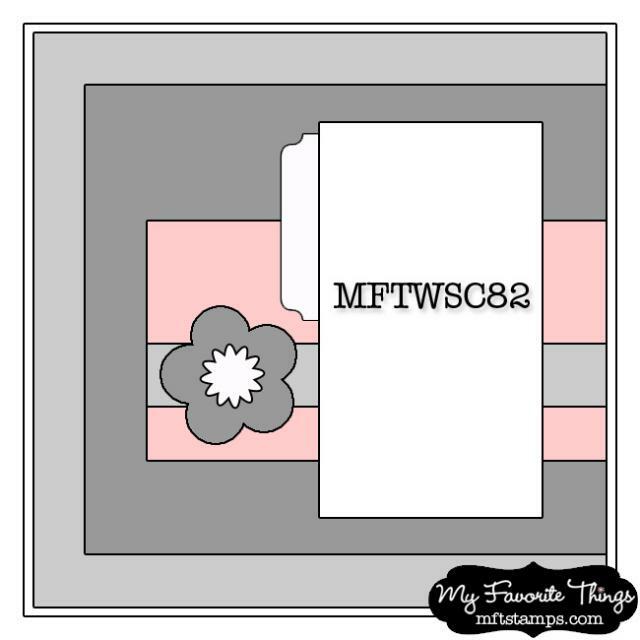 Very little stamping...just the tiny tag and the large tag outline. The fern and bird dimensional stickers are by K&Co. Have a great day...I'm heading out to work shortly, so crafty time is done for today! 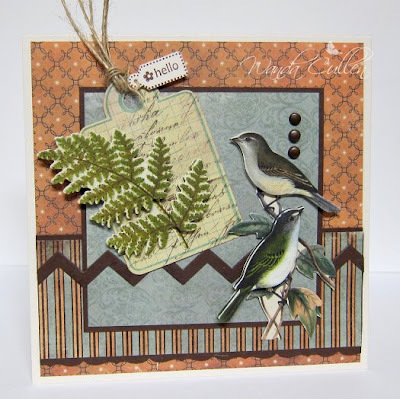 Case Study Challenge - Kristi Lockhart is guest muse. 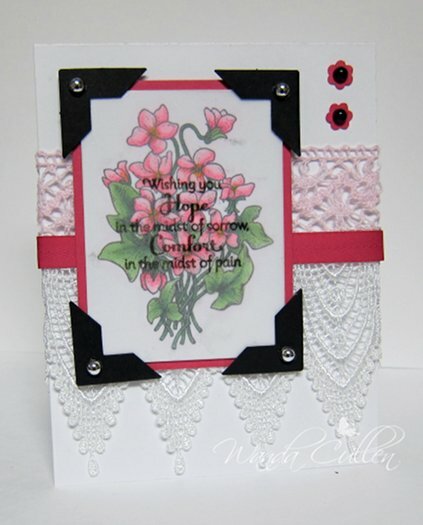 I pulled the stitching, postage edges, heart border and ribbon elements from Kristi's card and incorporated it into mine. COPICS: YG0000, YG11, YG13, YG15, YG17, G000, G00, G0000, C0, C1. 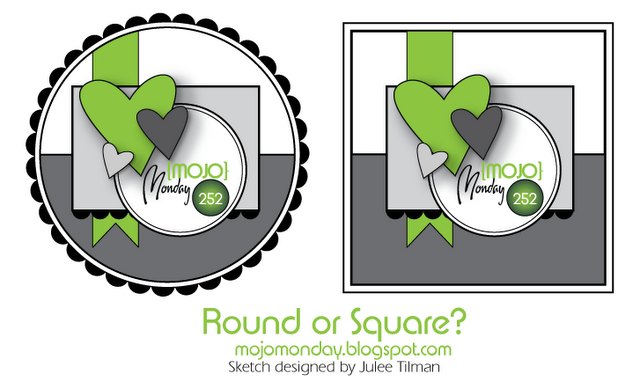 It's been awhile since I've played along with the MFT Wednesday Sketch Challenge, so this card remedies that problem! 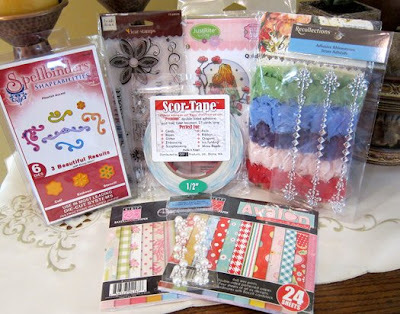 I'm using some papers from the "Avalon" Bazzill Basics Paper pack and this pack, along with some other goodies, could be yours if you enter my blog candy give-away by participating in this week's 200th Color Throwdown Challenge! Check out the details HERE if you're interested. Each one of the design team members is giving away free goodies! 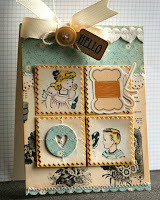 Back to my card...I'm also playing along with the Ways to Use It Challenge on SCS to use stitches - faux or real. Celebrating CTD #200 & Blog Candy Give-away! 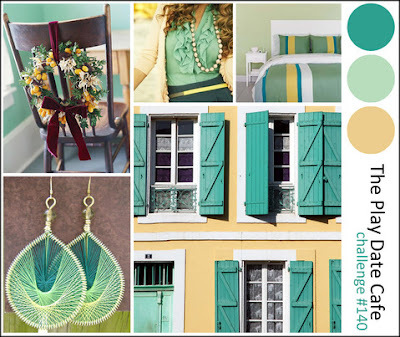 In honor of our 200th color challenge, the Color Throwdown gals have a little fun planned for you this week. 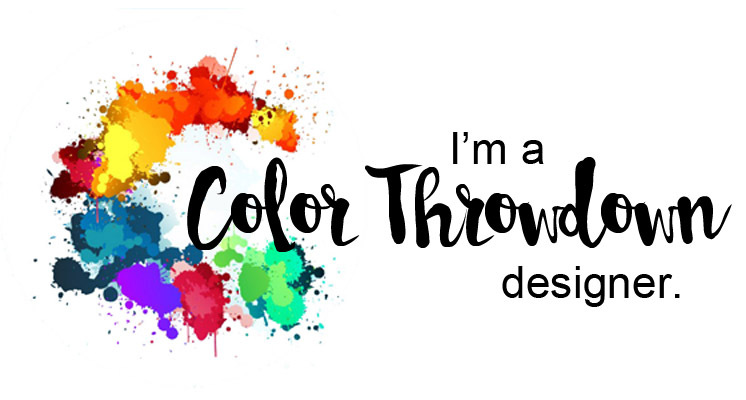 Not only have each of the CTD designers created fantastic projects using the colors and inspiration photo for this week, but each team member also has blog candy to give away to a lucky Color Throwdown participant! 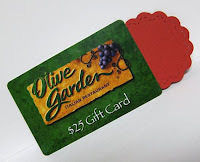 So what's up for grabs and how do you play along? First, visit each of the CTD team members blogs and leave comments on their projects. 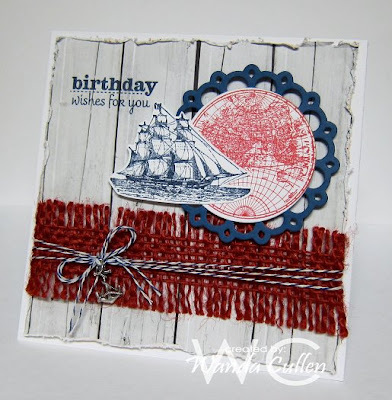 Next, create a card or project using the colors from this week's challenge and submit your project on the CTD blog HERE using the Inlinkz at the bottom of the post. 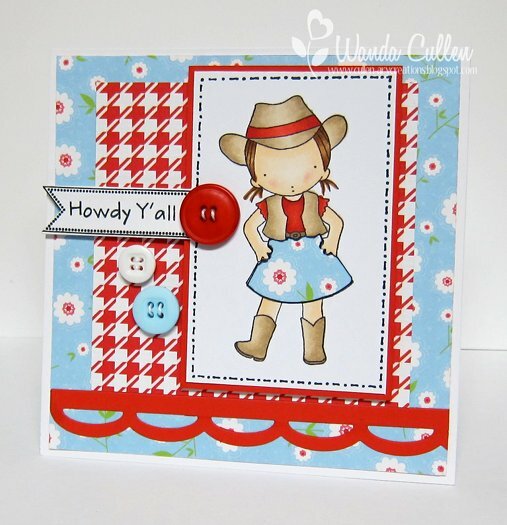 Lynn is our hostess for this week and she has chosen a really fun inspiration picture for us! As always, if you don’t have the exact colors, it’s no problem...just substitute with what you have that’s close to this week’s colors. 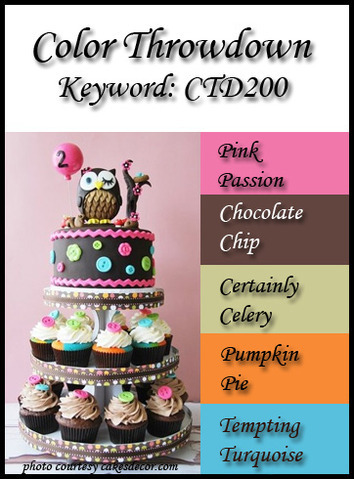 And, don’t forget to use the keyword CTD200 if you upload your project to an online gallery. 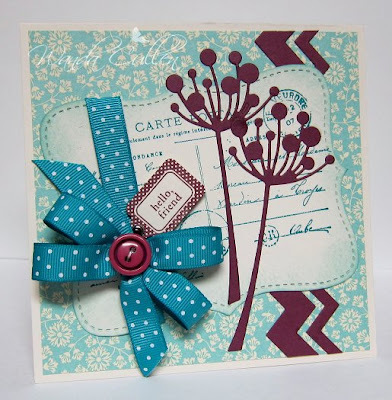 Next Tuesday, you'll want to check back with the CTD blog to see the featured stamper and the blog candy winners from each of the DT members' blogs will be listed. You must participate in this week's Color Throwdown Challenge in order to be eligible to win any of the blog candy that's being offered by the team. IRL, the herringbone BG looks more like a light orange shade instead of the golden shade that shows up in the photo. 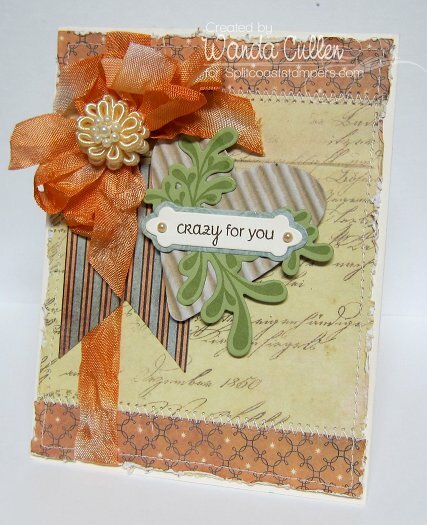 :-( The card base is Pumpkin Pie CS and is 5 1/4" square. I wanted to do this paper quilting technique that I used when I was a Limelight Designer on the Flourishes' blog in February. If you want step-by-step directions on the process, please refer to my post HERE. I used the Kassie's Brocade EF (love that Cuttlebug is making their folders in 5x7" sizes now) to emboss the finished star pattern and I used Creative Memories' square punch which is a bit larger than the 1" squares I used in the tutorial (it's about 1 1/4" square). Are you still with me - lol? This is a long post and last but not least....here is my BLOG CANDY for some lucky participant! 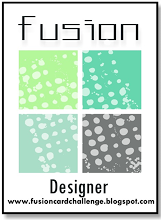 Here's the list of all the design team members...go check them out! 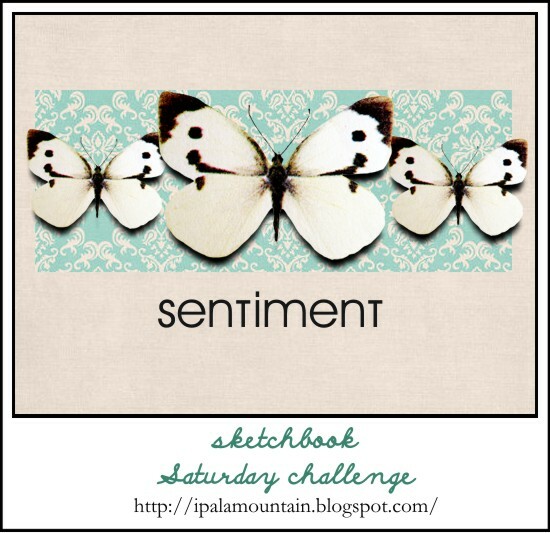 Hope to see you join in on the fun...can't wait to see what you create! 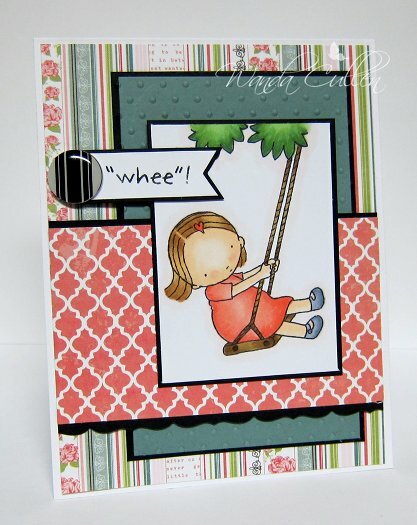 Using Chupa's layout for her Sketchbook Saturday Challenge, I also played along with the SCS Color Challenge - Raspberry Ripple, Pink Pirouette, Crumb Cake and neutral of choice with dessert option to include an element or edge that is torn. The flowers are made from Raspberry Fizz felt by PTI. It's difficult to see, but the black BG is embossed using SU's square lattice EF. ACCESSORIES: Circle flower Die-Namics by MFT, Fern punch by MS, Fanciful Flourish die by Cheery Lynn Designs, Square lattice EF by SU, Light pink pearls. It's good to be back in my stamp room again after a week at the beach last week! It was great to be with extended family members, but have to admit...trying to survive triple digit temperatures almost got the best of me! Fortunately, our beach house had a pool in the back, so I opted for cooling off there rather than deal with the hot sand several days. OK...on to the business of papercrafting! :-) I created this card for the Timeless Tuesday Challenge on the Flourishes blog to use a sentiment as the focal point. None of my sets had any large sentiments, so I opted to stamp the largest one I had on vellum and overlay it on this floral image. I guess my brain is a little fried, because I thought I was using the SCS Color Challenge colors only to discover after I was done that I forgot the Crumb Cake! Doh! 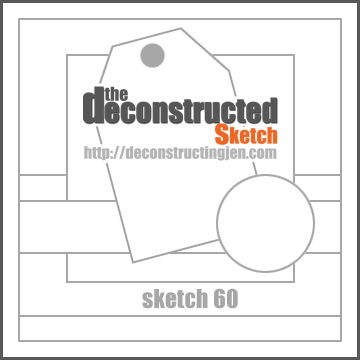 I used Jen Shults' great sketch for the Deconstructed Sketch Challenge #59. 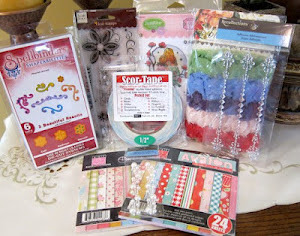 ACCESSORIES: Corner punch by SU, Silver & black adhesive pearls, Lace, Raspberry Fizz ribbon, Tiny flower punch ($1 bin at Mike's). Another month has rolled around and that means a new theme for the bartenders at Raise the Bar - bring on your red, white and blue color combos for your creations this month! As a reminder, we're taking a bit of a break with our challenges this summer and are only doing one theme a month for June, July and August. You have the whole month to play! I went with a nautical, masculine theme for this card. I love this burlap trim from Linda's Funkie Junkie online store and layered it with some baker's twine with a little anchor charm found in the jewelry section of Michael's. I hope all my American blog friends had a happy 4th of July! We celebrated with a family cookout and watching fireworks...an annual tradition! ACCESSORIES: Picot Circle and Circle Nesties, Burlap trim, Baker's twine, Charm, Distressing tool, X-Press It Foam.